Yes! 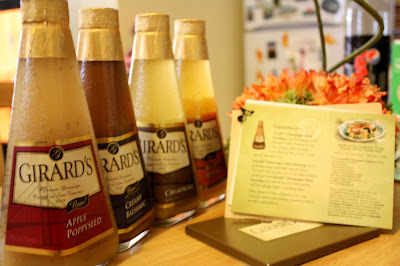 I am joining acmomcee.com Girard's Salad Premium Dressing giveaways. I would want to try this Dressing but since I am not a US resident, I'll find one in our local supermarket should I win the prize for a non US resident. I do love salad and by just looking at this elegant bottle makes me think of including a salad recipe for our weekend menu. I think everyone will agree about my first impression about this salad dressings. Elegant! Known for their premium quality and distinctive triangular bottle, Girard’s Salad Dressings are available in 18 unique varieties. Girard’s has partnered with Epicurious.com to create the Everyday Elegance, which combines recipes and cooking tips with guest entertaining and family mealtime advice while offering readers new ways to experience Girard’s beyond the tossed salad. Please check out Happy Home Working (www.acmomcee.com) for the details and mechanics of Girard's Salad Dressing Giveaways. Patikim ako kapag nanalo ka ha. I joined too, goodluck to us hehehe..
sasali ako nito...hehehhe...mahal kaya nito...yung salad dressing namin momurahin lang...lol!